Provisional Government (Vremennoe pravitelstvo). The Russian government from the February Revolution of 1917 (15 March 1917) to the October Revolution of 1917 (7 November 1917), composed of members of the Constitutional Democratic party, Russian Socialist Revolutionary party, Octobrist party, and Russian Social Democratic Workers' party (Mensheviks). The Provisional Government favored continuing the war with the Central Powers and tried to maintain the unity of the Russian Empire in the new democratic Russian republic against the autonomist and separatist aspirations of the non-Russian nationalities. It attempted to introduce reforms gradually and faced opposition from the revolutionary wing of Russian social democracy, the Bolsheviks. 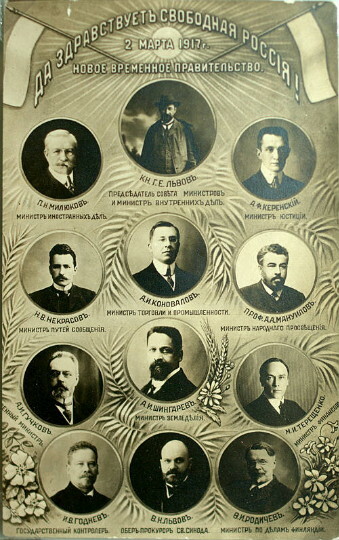 The Provisional Government established gubernia (and county) executive committees chosen by the local zemstvo assemblies and revolutionary committees. They were headed by gubernial commissioners. Many Ukrainians were chosen for those local administrative positions in Ukraine. The Provisional Government appointed Dmytro Doroshenko krai commissioner of the occupied regions of Galicia and Bukovyna; he, in turn, appointed Ivan Kraskovsky gubernial commissioner of the Ternopil region and Oleksander Lototsky gubernial commissioner of Bukovyna. In Ukraine a dual governing structure was agreed to in principle, in which the Provisional Government was to share power with the Central Rada (unlike the situation in most of the former empire, where the soviets were contesting for power). The Provisional Government attempted to limit the competency of the Rada, however, and a mutually acceptable solution of power sharing was never worked out. Prince G. Lvov headed the Provisional Government until 20 July; after a period of crisis, Aleksandr Kerensky assumed the leadership of a coalition government on 6 August and remained head of the government until its demise. At first the Provisional Government took a negative view of the Central Rada's demand for the national-territorial autonomy of Ukraine, and the Central Rada defied it in its First Universal (see Universals of the Central Rada) and by the establishment of an autonomous Ukrainian government, the General Secretariat of the Central Rada. But since the Provisional Government was threatened by increasing revolutionary unrest throughout the country, it decided to come to terms with the Rada. On 11 July the Provisional Government ministers Kerensky, M. Tereshchenko, and I. Tsereteli came to Kyiv and negotiated a compromise: the Provisional Government would recognize the General Secretariat as the supreme organ of government in most of Ukraine, and the Central Rada and its General Secretariat, recognizing the Provisional Government, would refrain from a unilateral implementation of autonomy and would co-opt members of national minorities in Ukraine. The agreement was codified in the Rada's Second Universal. The Provisional Government did not agree with the Statute of the Higher Administration of Ukraine drafted by the Rada, and instead issued its own Instruction (17 August), which limited the rights of both the Rada and its General Secretariat. The Provisional Government, however, did not even hold to the Instruction, but hindered the Rada and the General Secretariat from establishing their authority in Ukraine. Of the members of the Provisional Government the Georgian I. Tsereteli was the most sympathetic to Ukrainian demands, and the members of the Constitutional Democratic (kadet) party were the most ill disposed. The minister M. Tereshchenko, though of Ukrainian nationality, showed little sympathy for the Ukrainian cause. A delegation from the General Secretariat of the Central Rada was in Petrograd in November to settle differences with the Provisional Government when the Bolsheviks took power.